Link courtesy Tucson Computer Society. YOU MIGHT WANT TO READ: SECOND LOOK AT UNITY for Natty Narwhal FOR UPDATED INFORMATION. Wow! If you remember my First Review of Ubuntu’s Unity interface, I was very critical. While it still needs some work, vast improvements have been made. As you can see from the image above, I was able to customise the background, and change am/pm, and put the buttons on the right hand side. NONE of which I could do in the 10.10 netbook remix. USB Flashdrives also mount correctly. Remember we are running off the livecd here. So nothing we do here remains, once we reboot. But this is a way to look at Unity without installing. 1. In the Synaptic Package Manager, under Settings/Repositories, I had to enable the universe repository. 2. Trying to get a terminal window was a little tricky. But if you click on the button top left, and search for “terminal” you will find it. and you will have the Unity interface. 6. Note that libreoffice (which IMHO is NOT ready for Primetime) comes installed standard, instead of Open Office. Firefox 4.0 is here. I could not get empathy to work, but that’s primarily due to my unfamiliarity. This is vastly improved over what I saw. It will require a lot of patience to learn where things are. The Applications/Places/System is all gone. Instead you click on the Ubuntu Icon (top left) and navigate to the folder with the magnifying glass. NOT the magnifying glass with the square, the magnifying glass with a plus (+). There you will find most of the system/administration tasks. The one thing they did NOT change: the icons are still cryptic! One of the most frustrating things I noticed with Unity is that the application menu: File/Edit/View/Search (see photo) is no longer a part of each application. That’s now moved to the top task bar. 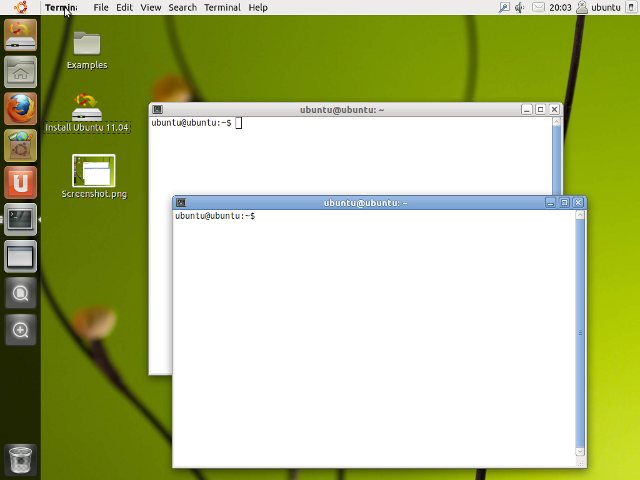 (you should be able to see the terminal window Menu in the photo). Not certain if I like that.